I submitted Charlie's pic to the Old Lake Highlands Neighborhood Assn. in Dallas, Texas. He was chosen as the pet of the month! We just love our little boy! Comments for Charlie is published! Charlie totally deserves the honor! Congratulations and rock on Charlie! You would sure have had our vote Charley! 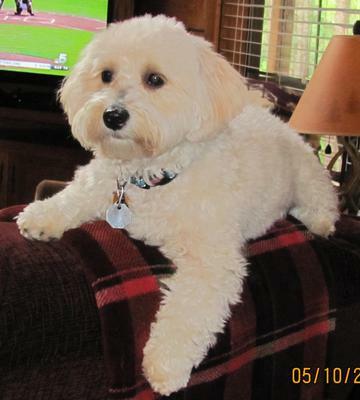 What a great pose, and you are one gorgeous little Coton. My little girl likes to decorate our furniture like that also. Just so cute! CONGRATS! to you and glad your mommy shared it with us. Congratulations! And Charlie is certainly one handsome pup! Congratulations to you and Charlie for getting selected as Pet of the Month. Charlie is gorgeous, handsome and looks like a great dog. Love his pose.